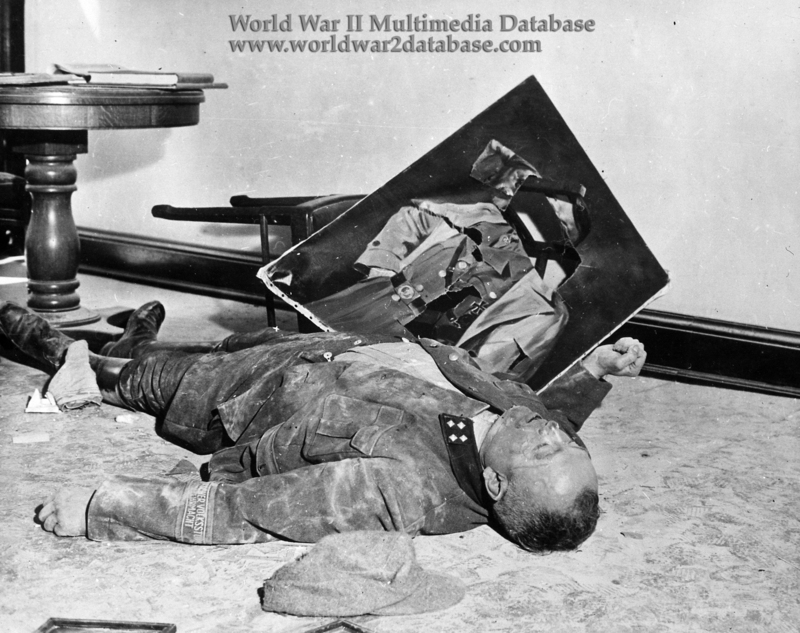 Volksturm (People's Militia) General Kurt Walter Donicke (July 27, 1899 - April 19, 1945) lies dead in the Neu Rathaus (New City Hall) in Leipzig. Donicke joined the Nazi Party in 1925 and quit his job as a carpenter to become the Nazi Party Manager in 1928. He was one of the Nazi party members elected to the Reichstag (German Parliament) in 1932. He was elected as National Socialist District Captain in 1933, retaining that post until 1937, when he became Mayor of Leipzig by appointment. On October 10, 1938, he was removed from office due to incompetence and removed from all Nazi Party functions. Donicke joined the Volksturm in October 1944 and commanded the paramilitary units in the defense of Leipzig. On April 14, 1945, he attended a meeting at the Neu Rathaus with General Hans von Poncet, Mayor Alfred Freyberg, and General Wilhelm von Grolman. Von Grolman refused to blow Lepizig's bridges and Donicke and von Poncet demanded a defense to the last man. Volksturm units made their last stand at the Volkerschlachtdenkmal, (Battle of Nations Monument to 1813 defeat of Napoleon built by Kaiser Wilhelm with private donations) south of the city. They were stopped by concentrated artillery fire from the 69th Infantry Division, effectively ending resistance. American tanks were able to reduce the last stronghold around the Rathaus, the City Hall, where Donicke committed suicide. Four of the Volksturmers were found shot dead, after heavy drinking. The picture was probably vandalized by American troops who liberated the Rathaus.